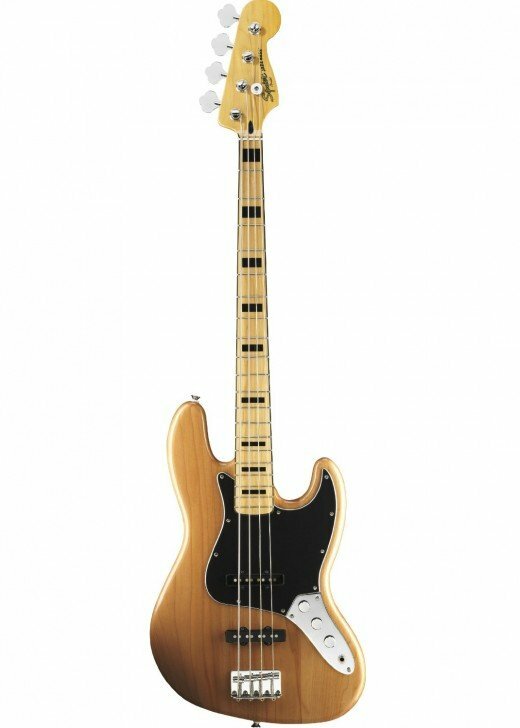 The Squier by Fender Vintage Modified Jazz Bass lineup offers some incredible values. 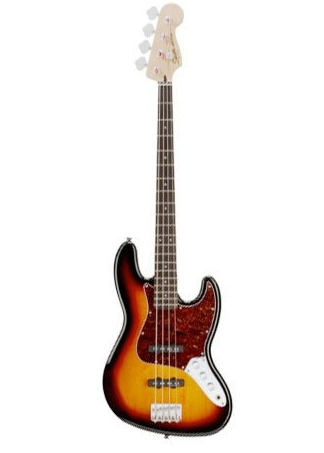 This review takes a look at the Squier by Fender Vintage Modified Jazz Bass series. Squier is a company owned by Fender, one of the most iconic guitar makers in the world. 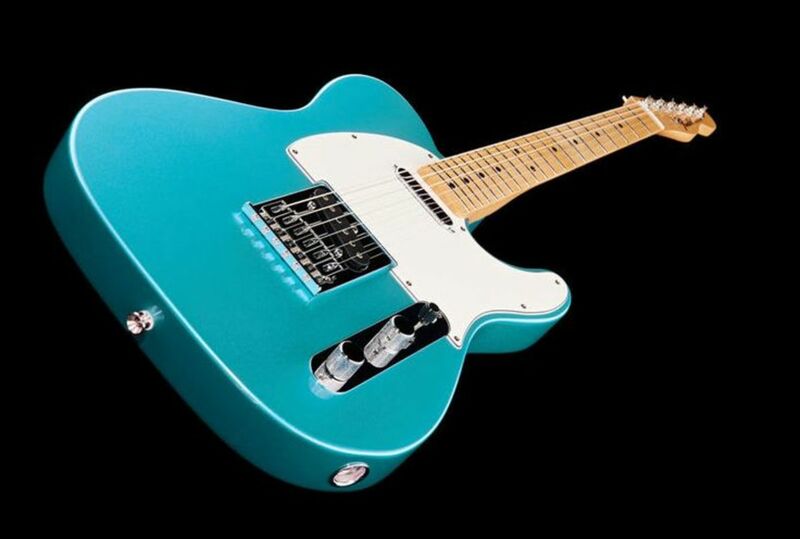 Through the Squier brand, Fender produces lower-cost versions of their classic instruments, such as the Stratocaster, Telecaster, Jaguar, Precision Bass and Jazz Bass. Even the best Squier instruments won't cost much more than $300, and the Squire Vintage Modified Jazz Bass comes in just under that mark. At such a low price point you might imagine Squier guitars and basses are targeted at beginners, and that's pretty much true. Squiers are starter instruments for countless guitarists and bassists, and a great way for a newbie to jump into the music world without dropping too much cash. But the Vintage Modified line, despite the low cost, has a bunch of features that have veteran bassists' attention. These basses have been a pleasant surprise since their release, and have made a Squier fan of many former gear snobs. I’ve been a musician for 30 years, and I've played guitar and bass in a few bands. I have always loved Jazz basses and the Vintage Modified lineup seemed like a great way to add a classic-looking bass to my lineup without spending a lot of cash. But could a Squier really meet the needs of a veteran player who was used to handling Warwick, Spector, Ibanez and high-end Fender basses? There are five different Jazz basses in the Squier Vintage Modified line. Here’s a look at them one by one. This is the basic Vintage Modified Jazz Bass, and the other models are built to similar specs, but with different tonewoods and appointments. Notable in this model is a basswood body and rosewood fingerboard, which will have this bass sounding a bit warmer and woodier than the ‘70s and ’77 models below. The bass comes in 3-color Sunburst and Olympic White. Electronics: Basic two volume, one tone controls. Additional Features: Chrome hardware, 34-inch scale, Tortoiseshell pickguard, synthetic bone nut, medium jumbo frets. All of the Vintage Modified Models follow a similar basic outline for their specs. Differences will be noted with the individual models below. In the ‘70s version we’re looking a soft maple body and maple neck with a maple fretboard. All that maple should make the bass very bright sounding, but I’ve never had any trouble dialing in bassy, rounded tones. The woodgrain is very attractive, and even though the body is several pieces glued together it’s tough to see where the pieces join. The whole ‘70s vibe, complete with block inlays, just looks super cool, and the bass sounds great. This bass comes in the original Natural, and now Candy Apple Red and Olympic White. The ’77 model has an Agathis body with a maple neck and maple fretboard. Agathis is a warm, inexpensive tonewood that will bring similar nuances as mahogany, though perhaps without the same richness. Still, it works just fine in a bass in this price range. Combined with the maple neck and fingerboard this bass walks a tonal mid-line between the two aforementioned instruments. But the look may be where it’s at for you, and the black body and pickguard are very sharp. It also comes in Amber and 3-Color Sunburst. Think you can't afford a decent fretless bass? Check this guy out! It only comes in 3-color Sunburst, but with that gorgeous pickguard-less façade it really doesn’t need anything else. The VM Fretless has an Agathis body with an Ebonol fretboard. Ebonol is a synthetic material used as an ebony substitute. Again, on a bass in this price range there are no complaints. If you always wanted a fretless bass there aren’t many better opportunities than this one. Like with the fretless model, the Squier by Fender Vintage Modified series offers a great way to grab a 5-string Jazz Bass for a reasonable price. This bass is similar to the Vintage Modified ‘70s Jazz Bass, but of course with an extra string. That means a soft maple body, maple neck and maple fingerboard. It also means that great ‘70s look, and those cool block inlays again! If you need that low B, here’s your bass. If you’re a metal guy you might want to look elsewhere, but for every other genre from rock to jazz to country it’s hard to find a better 5-string for the money. Though I tried them all except the 5-string and fretless, the VM Jazz I gravitated to was the Natural ‘70s model. I’d compare them all to a good Fender MIM Jazz Bass in construction and feel. As far as sound, maybe even a little better. I like my pickups dialed in with the bridge position on 10 and the neck position back just a touch. I can go a little more Jaco-y and take the neck position back further, or I get growly for more aggressive music with both pickups on 10, and I can turn off the bridge pickup and turn the neck up for a passable P-bass impersonation (not the strong suit of any Jazz bass). I usually get the sound I want from the VM Jazz Bass. Again, it has a sound quality far above the standard Squiers, with pickups that are much stronger and richer. Remember that this is a $300 bass. It's not going to compete with a Warwick or a Lakland, or even an American-made Fender, but it's a great sound for the money. If you go in thinking Squier instruments are low-level basses for beginners, you will be very surprised. Aside from a minor fret issue which ended up being humidity related, I have been extremely happy with the construction. It is head and shoulders above the standard Squier Affinity Jazz and Precision basses. The one-piece, C-shape, maple neck feels smooth and easy to maneuver. I have my action set somewhat high, but I still have no issue fretting notes in the higher registers. All notes ring clear without buzzing or an odd feel at any position. Though I've heard horror stories with Squier basses, I have had no issues with electronics or hardware. My bass was apparently made in Indonesia. Basses made overseas do often have quality control issues, but then again so do American-made basses (though to a lesser degree). It's important to realize quality will vary with any particular model, so make sure you buy from somewhere with a good return policy. The bottom line to the entire Squier line of guitars and basses is this: What do you want out of the instrument? The VM Jazz Bass is an inexpensive instrument that sounds better that you'd expect and looks better than it should. But, it's still a Squier. It's not likely to go up in value, or even maintain its value. I'm not sure how it will hold up in the long run, as I've had it less than a year. This is not the bass you pass on to your grandson, nor is it likely the bass you find wrapped around your shoulders if you finally make it big. This is the bass you noodle around with in your basement, and maybe play a few gigs with. This is the bass you don't feel bad about modding. This is the bass that makes your friends say, "Wow! Is that really a Squier?" When I bought my bass I was looking for an inexpensive instrument that gave me the best value for my money. I feel pretty confident that I've found that in the VM Jazz. I've been very happy with it, and if I ever found myself in a band again I would not hesitate to use it in that capacity. If this is what you're looking for, you might find the Squier Vintage Modified Jazz Bass to be right up your alley. Which VM Jazz do you like the best? Squier basses are better than you think, which you hopefully realize after reading this article! 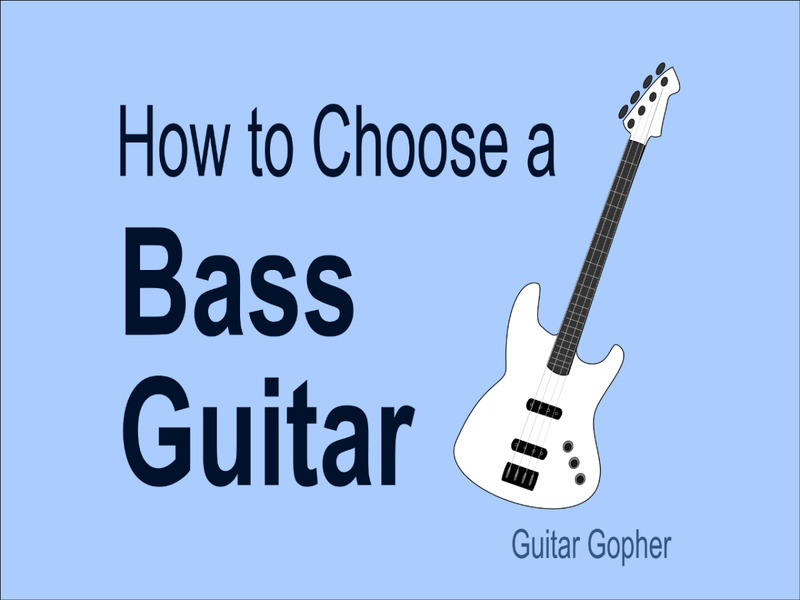 Here are some more resources to help you choose the right bass. Is Squier by Fender a Good Brand? Get the lowdown on Squier guitars and basses. The Vintage Modified Series rocks, but what can you expect from the rest of the Squier lineup? Take a step up to the Fender Standard (MIM) Jazz Bass. Truthfully, the VM Jazz is close second, but these are some great instruments modeled after Fender classic. SX makes some great bass guitars in the Ursa series that compete strongly with Squier. Check out SX bass guitars and decide whether or not they are worth your time and money! Bought mine new, VM 5sting 70's model love this bass worth ever damn penny. Hi Barcode 101. I've been pretty happy with my '70s VM Jazz. They are both great basses though! Good luck with your decision. I don't think you can lose. Bought a Squier VM 5 strings and is going to replace my Ibanez BTB 555 MP for recording ... great sound for distortion and well defined. I'm really impressed, and I feel bad for my BTB (which cost the double). I just bought a vintage modified jazz its so amazing I'm considering selling some off my more expensive basses because the playable and sound of this bass sounds better than I would have ever imagined and for much much less money! This bass was hanging on the wall and set up was perfect no buzzing no sharp fret edges to cut your hand and the wood was all one piece body not glued! I'm so Happy I bought it! I purchased the VM 70's natural a year or so ago. My first impression was very positive. The Squire is very well made with what seems great attention to fit and finish. The grain of the maple viewed through the clear body finish follows the contours of the body for a truly beautiful visual experience. Initial set up of the bass with the factory installed round's was good. The neck was well adjusted and the frets were well finished. I am a fan of flat wound strings and I love to modify my bass guitars so after a few months of ownership I replaced the bridge with a Fender high mass model. I replace the original single coil pick ups with DiMarzio Ulta Jazz pick up set. 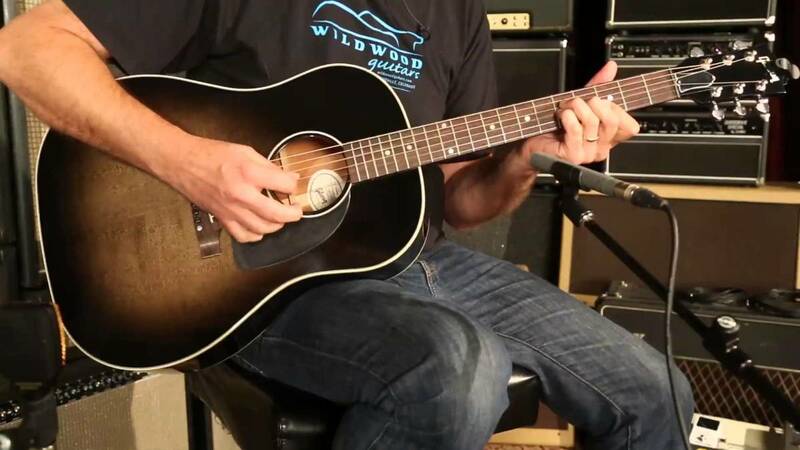 The VM now wears D'Addario XL flat wounds 45/100's. The VM now is capable of a multitude of different sounds ranging from vintage Jazz to modern P-Bass. The bass spends most of its time hooked up to a Hartke HD50, a great combination for apartment practice. I have tried more that a few MIM Jazz basses and the Squier VM feels and plays better, in my opinion. You will not go wrong it choosing to purchase a Squire Vintage Modified. Thanks for adding your thoughts, Partly Dave, and glad you found somewhat of a hidden gem as I have. I have the 77 VM Squier in sunburst. Your review is accurate - its great for the money. I have a Modern player Jazz too (now, that IS real value for money - a lovely bass), but its heavy and I find at home, I use the Squier for practice. And then when I'm loading up for a gig I think, I'll take it as a back up. And quite often end up playing it all night. I agree re durability - its only 5 months old and I'm only out gigging every few weeks, so I'll be interested to see how it holds up. Jack socket worked its way loose, so I had the plate off and tightened that back up. I reckon bridge is the weakest component - I'll get a hi mass one at some point, just for longevity. And at £246, I had no qualms at drilling a fender thumb rest onto it, just back from the heel. For my style, that gives a lovely warm tone. With one eye on resale, I wont be drilling my other Jazz. All in all, I'm very pleased with it and would recommend it.